Who has been the biggest rookie surprise so far from this Miami Dolphins draft? My vote is for receiver Brian Hartline, who got the start last Saturday against Carolina and could start again Thursday night at Tampa Bay. I tweeted it at the time (Twitter.com/MikeBerardino) but probably not enough was made of a tremendous heads-up play by Hartline on that 23-yard TD pass from Chad Pennington to Ronnie Brown on the Dolphins' first drive against the Panthers. Ronnie ran a circle route and Hartline, lining up in the slot, was able to pick off the linebacker (fourth year man James Anderson) covering Ronnie, which left him WIDE open on the right sideline. "It was a man coverage, so I knew someone was up on Ronnie," Hartline told me after the game. "My idea was I really wasn’t worried about my guy (fellow Ohio State product Chris Gamble). I knew my man, wherever I went he would come with me. But I was trying to chip Ronnie's guy and free him up. It worked out. I saw [the linebacker] line up on the line of scrimmage and was able to get a pick. " And did Brown at least say thanks? "I told him, 'Hey, I got you a good pick,' " Hartline said. "He just laughed." 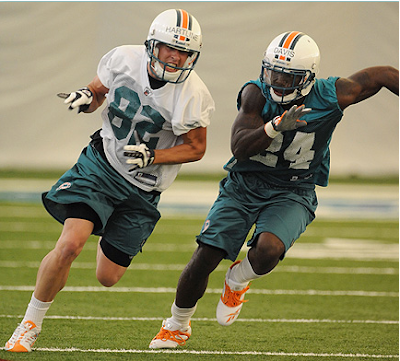 Dolphins' Hartline is "a brilliant kid"
K-State caught with their contractual pants down?